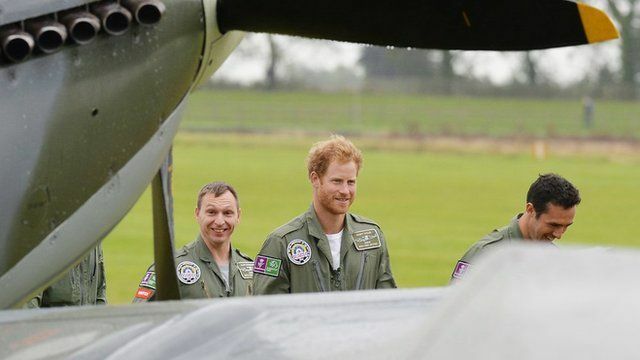 Prince Harry meets WW2 flypast crews Jump to media player A flypast involving about 40 Spitfires and Hurricanes is set to take place to commemorate the 75th anniversary of the Battle of Britain. Battle of Britain historic flypast due Jump to media player A flypast involving about 40 Spitfires and Hurricanes is set to take place to commemorate the 75th anniversary of the Battle of Britain. 'It was an absolutely awesome sound' Jump to media player Aircraft including 18 Spitfires and six Hurricanes have flown over south-east England to mark 75 years since the Battle of Britain's "Hardest Day". Battle of Britain flight under way Jump to media player Six historic aircraft from RAF Coningsby are taking part in events to mark the 75th anniversary of the Battle of Britain. The biggest flypast of Hurricanes and Spitfires since the Battle of Britain is due to take place on Tuesday afternoon. Wing Commander Tom Neil, now 95, who flew 141 combat missions during the battle, is due to take to the skies. Prince Harry was due to fly a two-seater spitfire, but the BBC's Robert Hall says the aircraft has become unserviceable. The Prince has given up his place to enable Battle of Britain veteran Tom Neil and two wounded servicemen to fly. Duncan Kennedy reports from Goodwood in West Sussex.